Links of London presents the essential silk sterling silver necklace. 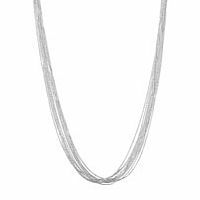 Features ten thread-like chains gathered together to create a glistening waterfall of silver. The perfect addition to any outfit, this Links of London necklace is chic, glamorous and versatile all in one.